The James Republic burger features 2 patties with onion jam between and white cheddar melted over both. James Republic in Long Beach, CA is a farm-to-table restaurant in downtown Long Beach. In the Marriott Hotel, it opens to the outdoors for a great feel. The night I was there they had all the lanai doors open and Long Beach's vibrant downtown was right there. 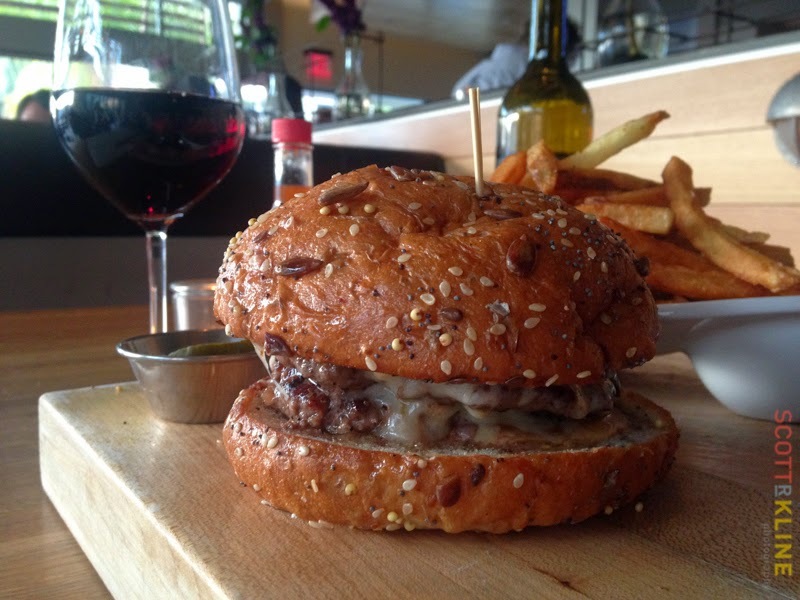 The Grass Fed Burger ($13) features two four-ounce patties, fiscalini white cheddar cheese, onion jam, fancy suace and house pickles. The nicely conceived two-patty configuration allows them to tuck the onion jam between the patties. The cheddar is melted around the whole thing. Everything blends together. I could have sworn I tasted mushrooms. The bun is nutty and sesame covered. Soft, but it held together well. The patties were cooked more medium well than medium, but I still enjoyed. I also ordered a side of pomme frites with jalapeño, rosemary garlic, malt vinegar aioli ($5). Fries were good. A little limp. Medium cut. Salty and peppery. I didn't taste jalapeño or garlic or vinegar. About halfway through, I found the malt vinegar aioli, which was awesome. The crispy brussels salad with frisee, benton's bacon and a sixty minute egg ($11) are not to be missed. The bacon is in chunks. I ate every chunk.